Local search engine optimization (SEO) is one of the best ways to give your business a competitive edge in your local market. It takes a while to implement and if you don't do it yourself, it can be expensive to get it done right. In this guide, I'm going to show you all you need to know about local SEO as a business owner so that you can understand what it's all about, how much you want to do yourself, and how much you should outsource to professionals. SEO is a process that takes a considerable amount of time before the return on investment begins to deliver. That's why some businesses decide to focus on paid ads, which can provide more immediate results. However, as we will soon reveal, SEO is by far the best long term strategy available to businesses. It shapes the long term market, and by investing in it, businesses can gain a huge advantage over their competition. For example, we serve several clients in the Dallas Fort Worth metroplex with local SEO and their return on investment is incredible. When you stop paying for advertisements, traffic to your website stops. When you stop doing SEO, your traffic will continue until your competitors start doing better SEO than you. As an example, check out what a great chiropractic marketing campaign looks like, where chiropractor SEO is a critical part of it. The best strategy is one that is based on how people use the internet to find the products, services, or information that they need and want. WordPress is the ideal website platform of choice. Google should be the primary search engine target for traffic. 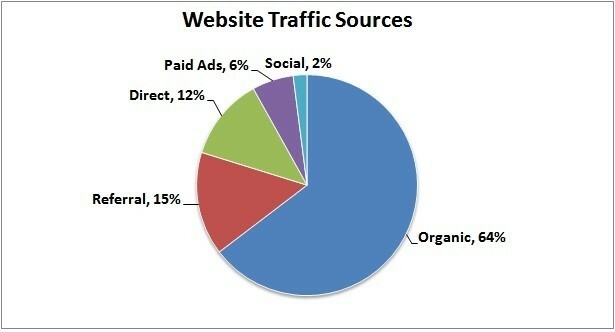 Organic search engine traffic is preferred over pay per click ads. SEO gets you this type of traffic. The ideal Google ranking target is from slots 1-5, with 1 being the best. There are many aspects of a Google search, including organic results, map results, local packs, paid ads, and snippets. 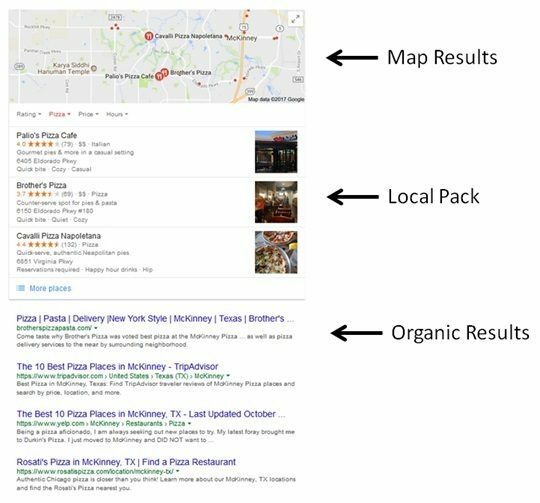 Google treats the importance of ranking factors for organic search differently than for local map/pack search results. A smart strategy takes into account the different ranking factors, how they are treated, and the cost effectiveness of executing a plan to improve these factors. Not only is getting traffic to your site important, but also giving the visitor a great user experience and focusing on converting them into a customer. We excel at SEO services for small business and can help you grow your business with more customers. Simply click on a button below to start the process. There are many content management systems (CMS) on the market today that allow for a foundational platform for websites to be built on. These CMS options compete with each other by continually being upgraded and supported for the benefit of their users. When the requirements for a website match the capabilities of a CMS, it becomes very cost effective for a business to use a CMS over a custom website that is built from scratch. WordPress is the clear winner here by user base, capabilities, growth, and support. 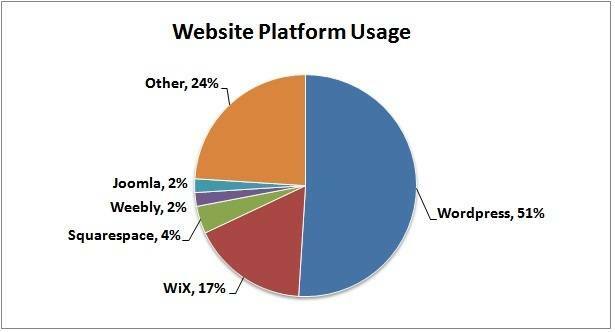 Conclusion: WordPress is the ideal website platform of choice. 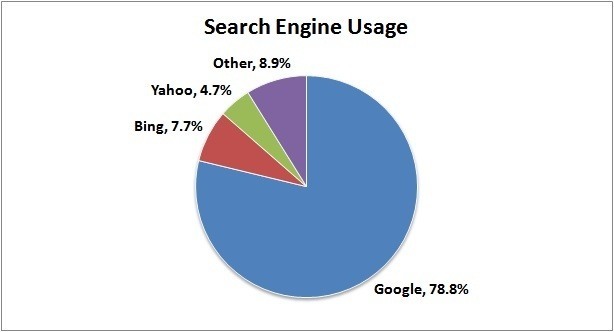 Given search engine usage statistics, Google is still the most widely used search engine on desktop computers. With internet use increasingly moving to mobile, Google has an even bigger margin on usage (90%+), making it the primary target for search engine optimization. That's why our local clients started using Plano SEO to grow their businesses. Conclusion: Google should be the primary search engine target for traffic. You might be asking why should you care about organic traffic that takes a lot of work and time to achieve, when you can just buy ads on search engines. That's a great question. What you have to realize is that there is a big gap on what searchers click on when they use search engines. It turns out that searchers click on search results over paid ads the majority of the time. Conclusion: Organic search engine traffic is preferred over pay per click ads. SEO gets you this type of traffic. Since search results get clicked the most, the next key thing to know is where do users click the most. 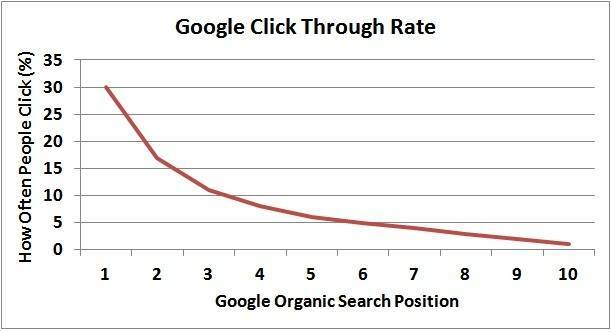 We call this the click through rate, or CTR for short. The fact is that over 87% of searchers click on the first 10 search results, which are usually found on page 1. Not only that, but the majority of clicks are on the first 5 results, which is at 72% of clicks. While the first 3 results claim 58% of clicks. The most coveted spot is slot 1, which gets clicked around 30% of the time. Conclusion: Page 1 of search results, or slots 1-10 on average, get the majority of clicks. The ideal ranking target is from slots 1-5, with 1 being the best. Over the years, Google has changed what it shows for a search result. Based on the keyword that the searcher uses, Google will determine how to shape its search results. At the heart of Google is the organic results for search. These have been the characteristic 10 results per page as shown next. However, depending on the keyword, Google inserts other sections above the organic search results that compete for the searchers' attention and clicks. For example, if there is buyer search intent like "best sneakers", you can see paid ads like the following. If there is a local lean to the keyword, like "pizza near me", then you will get a map result and also a few top selections to choose from before the organic search results, like the following. As you can see, the above results are for McKinney, Texas. These pizza places have benefited from doing some high quality McKinney SEO by showing up at the top of search results. 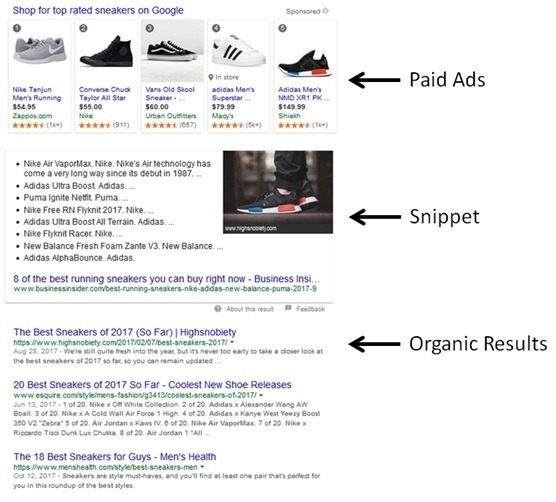 Conclusion: There are many aspects of a Google search, including organic results, map results, local packs, paid ads, and snippets. It's important to know the different factors that help determine how Google ranks search results. Keep in mind that no one other than Google knows exactly how their algorithm works, which is why the SEO industry is in constant competition with itself to determine what the major factors are and how to optimize them for the best results. The goal is to achieve higher ranking positions in Google search results. That is also why no one can guarantee SEO results. The algorithm is an unknown secret that is constantly changing and the SEO industry is always scrambling to uncover how it works. SEO practitioners therefore have to keep up with the latest developments and continue to hone a strategy based on real testing and results. Sadly, many SEO's don't keep up with the latest, and often use tactics that worked many years ago. However, the algorithm has changed and Google has started penalizing for using old tactics that took advantage of algorithm weaknesses. The solution is a serious SEO professional that continuously keeps up with the industry and is always testing to confirm theories about Google's algorithm. They must also be willing to do all of the best practices for webmasters as outlined by Google in order to avoid penalties. There are two main areas that a local business should focus on for ranking: local organic results and local map/pack results. 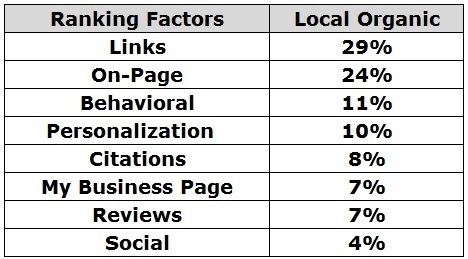 Google rates the factors for these two slightly different according to an extensive Moz study. However, the core ranking factors are the same. From the tables, you can see that the My Business Page is the biggest factor for the local map/pack results, but not near as important for local organic. Citations and reviews also play a much bigger role for local map/pack than they do for local organic. Conclusion: Google treats the importance of ranking factors for organic search differently than for local map/pack search results. A smart strategy takes into account all of the ranking factors and how they are rated, which determines ranking results. 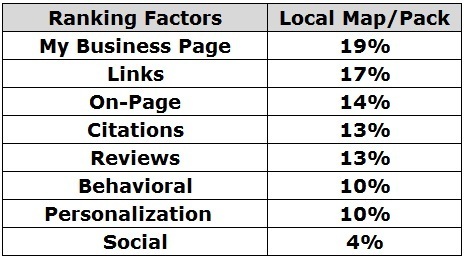 It also takes into account the different way these ranking factors are rated for local organic versus local map/pack search results. A complete campaign consists of maximizing each of the ranking factors such that competing businesses will not be able to keep up over the long run. You need to keep the whole marketing strategy in mind. 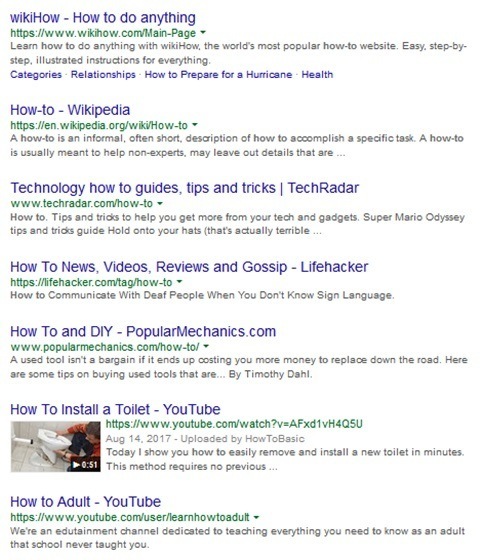 As an example, a great plumber marketing campaign usually consists of using both Adwords and plumber SEO. The paid ads will get you new leads in the near term, while the SEO has time to rank before it starts providing leads. Businesses on a tight budget often only focus on the highest ranking factors, while neglecting the rest. While this strategy sounds efficient, it is in fact short sighted, and often fails in the long run for lack of robustness. What typically happens is competitors continue to grow, leaving your website behind. That's why it's critical to focus on all of the factors, but priority of activities should be determined based on each ranking factor's influence on results. The other key thing to keep in mind is that Links are rated highly for both local organic and local map/pack search results. However, it is also the most difficult and the most expensive factor to improve. Link building takes the longest amount of time to implement. With all of these variables, things get complicated very quickly. That's why a high quality SEO firm that know what they are doing are very valuable to hire and execute this work for you. We have done this kind of work for years and can help you get started right away, just give us a call or book an appointment. However, if you are a do it yourself kind of person, don't worry, because I'll explain how each of the ranking factors work next. That way you can decide how much you want to bite off, or what you can outsource. Just keep in mind that you are looking at a tremendous amount of hours each month to do this stuff right. Backlinks are one of the most important ranking factors. As a refresher, a backlink is simply a hyperlink to an external website. For example, here is a backlink to Brian Dean's guide on building links. Notice the words "Brian Dean's guide" is highlighted since it's a hyperlink. Those words are called anchor text and the website link is the backlink. You have to be very careful with your anchor text, since it should look like the links happened naturally. Gone are the days where people can game the system and simply build a lot of spammy and low quality links to their website and hope for good results. Google is smart now and can detect quite a bit of those techniques. These days, you want to follow Google's guidelines, which is to get backlinks that happen naturally because other websites think highly of your content and want to link to it. There are many different ways to accomplish that goal. We always recommend following Google's rules so that you don't risk a penalty to your site. Another factor is internal links, which is where you link to your own website from your own website. This form of linking is directly under your control, so you want to make sure and do it right. There are several techniques that work well out there, and my favorite is using silos to create great content around a central topic. Not only is it good for SEO, but it's also awesome for the reader visiting your site. On-page optimization is simply making your website look good to search engines. There are a handful of things that you can change on each page of your website that is centered around keywords to help Google figure out what your page is talking about. Again, Brian Dean has a superb guide on how this works here. Google My Business is critical to use for your local business. All you have to do is create a page about your business with correct information, and then Google will send you a verification card in the mail so that you can verify your physical address. This page allows customers to find you in Google, submit reviews for your business, and it's a pretty big ranking factor for the local map and pack sections. You want to make sure that you put as much information about your business as possible on your page, including name, addresses, phone number, hours, information, and photos of your business. Once people click to go to your website from Google, it's important that your pages are done well so that the user experience is top notch. Not only do you want visitors to call you or fill out a contact form, but Google also takes note to how long they stay on your page before heading back to Google to look at the next site in search results. The goal here is to solve the intent of the searcher. There's an entire skill set out there called conversion rate optimization (CRO), which is where you use tools like heat maps, design a web page, get visitors, see how they responded to the design, re-tweak the design, and then get more visitors to see how the changes worked. If you do that enough times on repeat, the end result is a great web page that converts visitors into customers. As mentioned earlier, I highly recommend that you use WordPress as the platform for your website. On top of that, you want to choose a high quality theme which is also mobile responsive. Thrive Themes do a great job of combining great themes with functionality that you need on your site. You can then top off your site with awesome images like your business logo, pictures of your products and services, as well as staff. You want your website to be unique and have the flavor of your business on it. Reviews are simply where customers share their experience with your business. Important reviews include your Google My Business page, Yelp, Facebook, and the other major players for your particular industry. Always be professional and prompt when responding to reviews, and of course always be improving your business. You want to get at least 5 reviews minimum to start seeing some results. A citation is simply anywhere on the internet where your business name, address, and phone number appear, also known as NAP. The goal here is to have plenty of citations that are accurate and also precise. You want your website to also have your business NAP that matches info found elsewhere on the internet. A great place to put this NAP info on your website is in the footer section. Building citations is a tremendous amount of work, so that's where services like Bright Local come in handy to help you get the job done. And lastly, you should be creating a social media presence. While social signals are the least important ranking factor, you can get other benefits by getting in front of potential customers on the different social media platforms. The main ones to focus on are Facebook, Twitter, Instagram, Pinterest, and LinkedIn. Most people make the mistake of trying to do all of these at once, but it simply dilutes your efforts. Instead, find out where most of your ideal customers hang out the most, and choose that one single platform to focus your efforts on. The return on investment for your time will be much greater. Remember, you have to build an audience first before you market to them, otherwise nobody will see your stuff. For SEO, it's great to get your articles shared and liked. 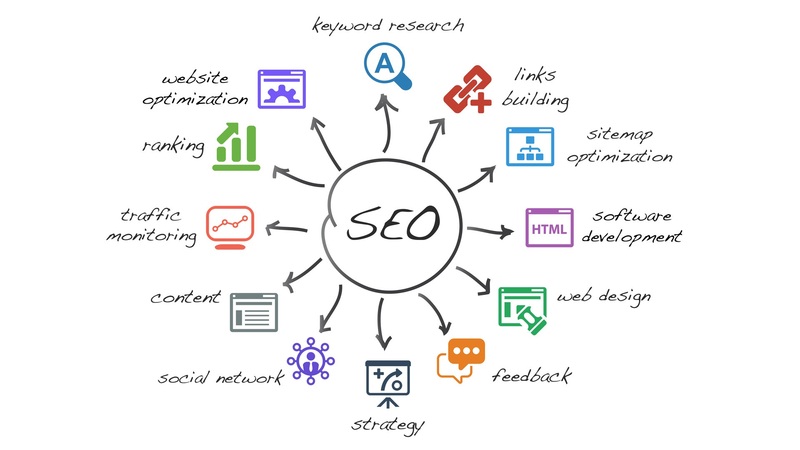 As you can see, there are a lot of different factors to be aware of when it comes to SEO. Usually, the only way to get good at it is to do it full time for many years. With experience comes skill. While you can definitely do the work yourself as a business owner, or have one of your employees do it, it may make a lot more sense to hire a professional team that is equipped with handling the different complexities involved. We are definitely available to help you out in this area. If you have any questions, or want to jump on a phone call, click on the button below to pick the perfect time and we will call you to discuss your business goals.